Picture this: dense, twiggy colonies of dark, gnarled branches buried in sand along the barrier dunes of Lambert’s Cove Beach. What is this tough plant that thrives in such a challenging environment? The answer is obvious each May when these same branches erupt with beautiful white flowers. It’s our native beach plum (Prunus maritima). This exceptional spring display lasts a few weeks then something even better follows. Over the following months plump, tasty fruits ripen, often creating a bountiful crop for harvest by the end of the summer. As its common name implies, beach plum is found in or around beaches in sandy, exposed, full-sun locations. More shrublike than a tree, its natural range extends along the Atlantic coast from New Brunswick, Canada, south to Virginia. When in bloom you’ll notice it in many Island locations. A devoted group of beach plum enthusiasts reside on Martha’s Vineyard, many with favorite plum trees in undisclosed locations from where to secure a harvest. Ask for a jar of beach plum jelly, but don’t ask where the fruit came from. At one time the beach plum was thought to have great potential for commercial orchard production. A book published in 1892, Cultivated Native Plums and Cherries by L.H. Bailey, details efforts made to establish named varieties as well as cultural recommendations for different parts of the country. Beach plum madness caught fire here on Martha’s Vineyard when summer resident Ruth Eldridge White began her attempts to commercialize the fruit in the 1930s. She describes her motivation: “The development of an industry from this native product seemed a sensible practical idea to me. A great industry has been developed on the Cape through the cranberry . . . Why shouldn’t the beach plum make as important an industry as the cranberry? The flavor is certainly more appealing. That sweet bitterness comes from a life of hardship, I guess.” Yet this wild plum has resisted large scale domestication. Perhaps that’s part of its allure. Today there is no viable industry on the Vineyard but there are plenty of devotees who harvest the fruits in early to mid-September to make their own jams, jellies and preserves. Attempts to improve the selection and culture of beach plum have revealed that it makes a decent orchard crop. One troubling aspect for commercial fruit production is that beach plum tends to be alternate bearing — fruiting heavily one year but not the next. The beach plum is suitable for the landscape for use as a low-branched shrub, and design-wise can be used much like dwarf ornamental crabapples. 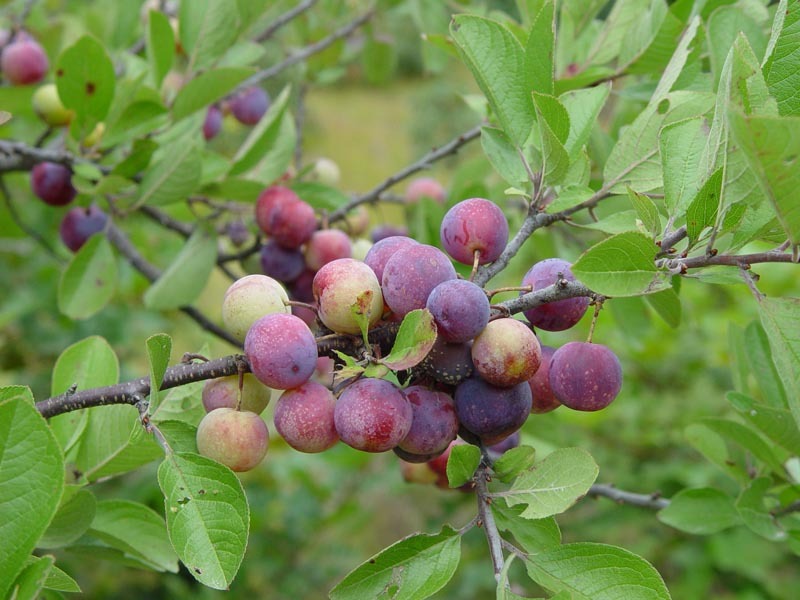 Critical components for beach plum culture include full sun, free-draining soil and organic nitrogen at moderate levels. Interest in local food production had led to a resurgence in efforts to domesticate this wild fruit that has thusfar been difficult to tame. For additional information on beach plum culture, harvesting and myriad fruit recipes and uses, see the Cornell University website, Beach Plum: a new crop for new markets (beachplum.cornell.edu/). Tim Boland is executive director of the Polly Hill Arboretum. This column appears weekly in the Tuesday Gazette.